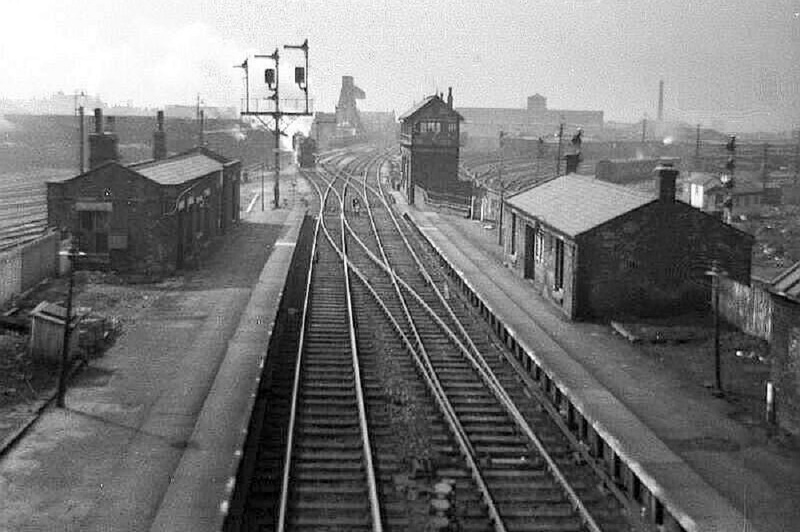 Walking along Chain Bar, Moston, just before 8:50am on Monday, 10 September 1962, was a bit scary. Having passed the dreaded 11-plus exam and selected a school (by opting for the same as most of my mates! 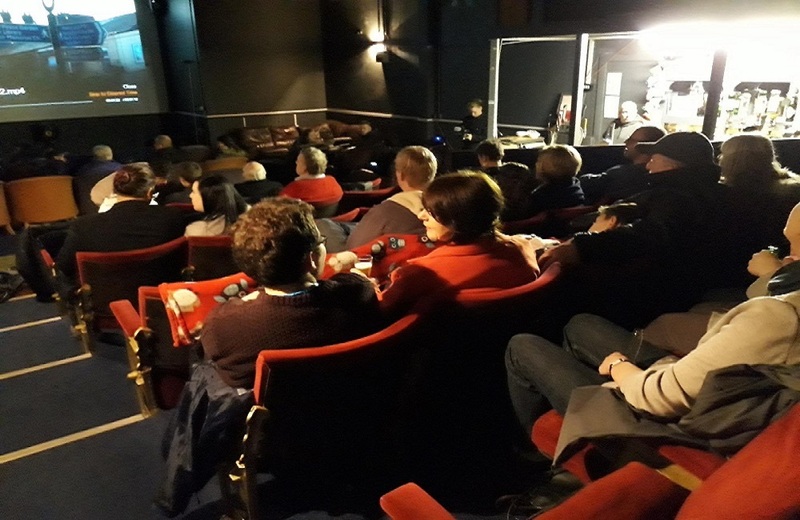 ), I was now arriving at my choice: North Manchester Grammar School for Boys, as it was then known. 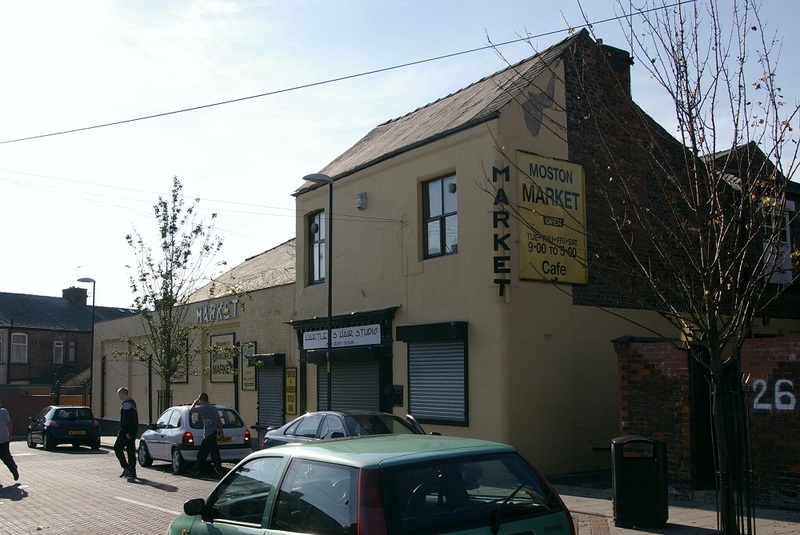 The front of the original buildings in October 1995, from the footpath (still there) that leads off Chain Bar, opposite Leyburn Road. The dining hall can just be seen behind the trees on the left. For the last six years I had enjoyed the company of more or less the same classmates. Now I was entering the unknown, among mostly unfamiliar faces: all male, all dressed the same, and subjected to a much stricter regime. I did gradually learn to find my way around and get used to the school’s severely enforced rules. However, this isn’t really the place to recount the terrors and triumphs of seven years of senior school life, so I’ll just give a little background detail. 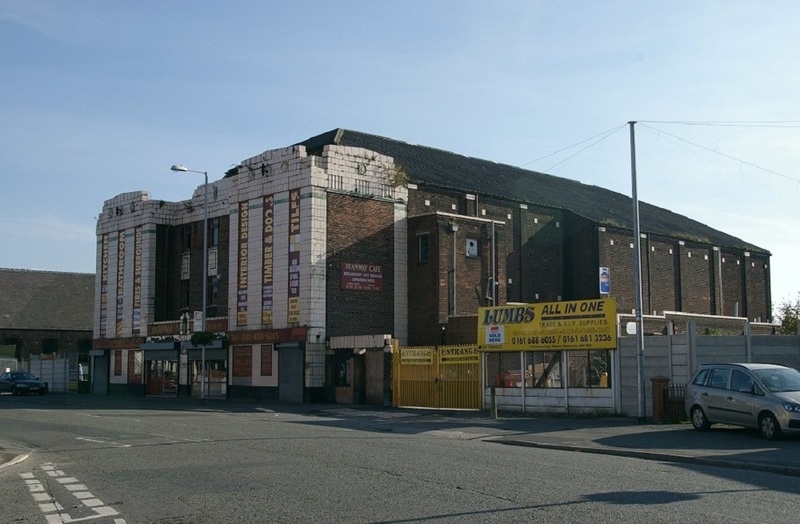 The school began as North Manchester Municipal High School for Boys in 1926, using the former Harpurhey Girls’ School on Beech Mount, Rochdale Road, as temporary lodgings until the new school on Chain Bar was completed. 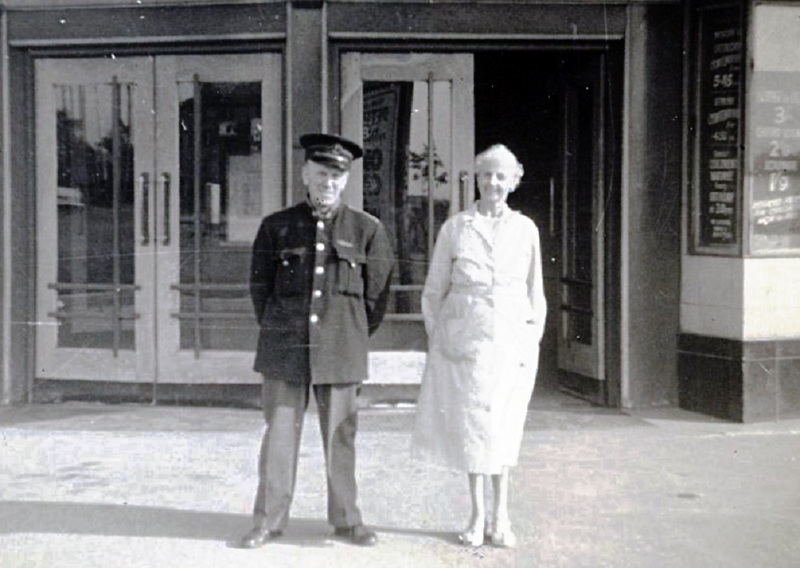 This was officially opened on Friday, 19 June 1931, by the Home Secretary, John Robert Clynes. 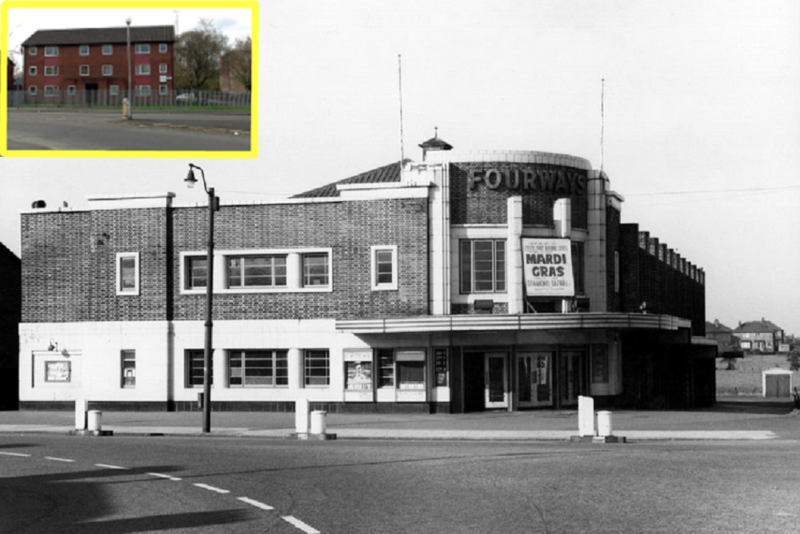 The buildings were of a modular design (also used at Burnage) and consisted of rooms surrounding a central grassed quadrangle, divided by the assembly hall. A playground on the western side, a large sports field at the rear and bicycle sheds on the east side, next to the footpath opposite Leyburn Road, completed the picture. 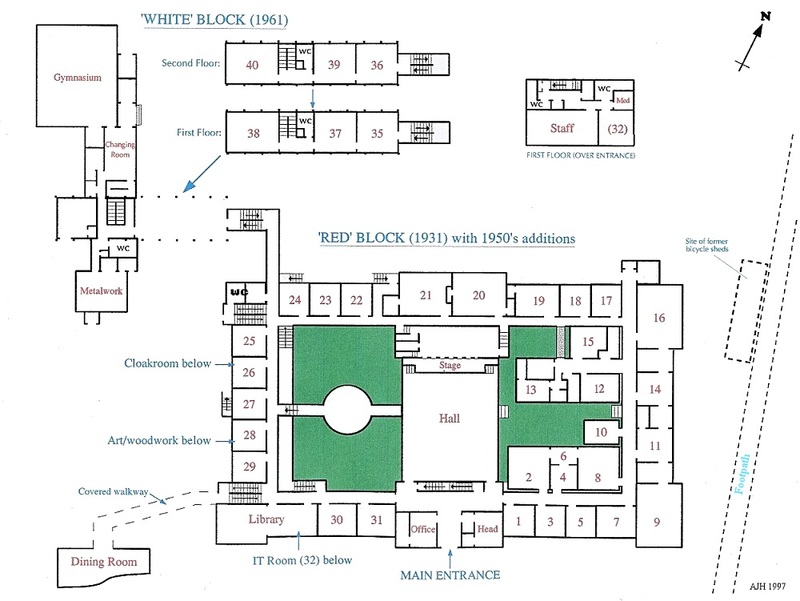 Plan of the buildings as they were between 1961 and 1997. A new library, converted from two classrooms, was opened in 1955, with further classrooms and laboratories added in 1957, inside one half of the ‘quad’. A separate dining-hall was also provided, originally accessed by a covered walkway across the playground. The year before my arrival, a two-storey extension, known as the White (or New) Block was built above the playground, with ground-floor gymnasium, changing rooms and a metalwork room on the other side. For a time, in the 1970s and 1980s, there was also a sixth-form recreation room. West side in March 1997, showing the White Block over the playground, with metalwork room on left and changing rooms beyond. 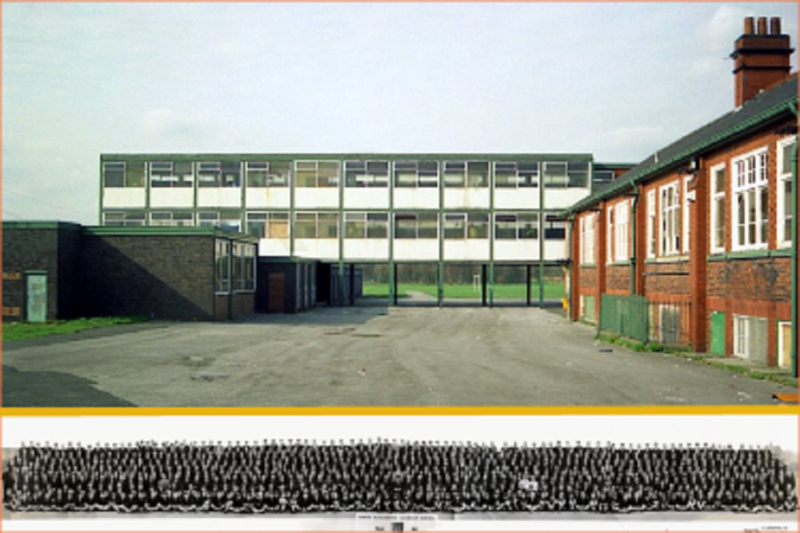 Bottom: school photo from March 1965; there were 777 pupils and 53 staff at this time. The first headmaster was James Crawford Burnett, succeeded in 1948 by Richard Martyn Sibson, a strict disciplinarian who ‘reigned’ until 1965 and taught Greek, Latin and Divinity. He was a controversial figure, with a system of rewards (6d or 3d, old money, which he called ‘medals’ or ‘half-medals’) and punishments that included confinement in a large cupboard for hours, or strokes across the thighs with ‘Black Bess’, a thick leather strap. Most of the teachers were rather more benign, happily. During this time, the school was labelled as a Grammar School, with the motto ‘In veritate fortis’ (strong in the truth). Interior views: Corridor near Room 25 (with lower corridor on left), Room 30 (typical classroom), Room 16 (Physics lab) and Hall, on Reunion night. Many of the 1930s fixtures and fittings were still in use right up to closure. In April 1965, Mr. Sibson retired (not entirely by choice, it was rumoured) and Ernest Robinson (former deputy) became acting head. Then in 1967 the school merged with the adjacent 1955-built Moss House, off Charlestown Road, and became ‘High School’ again, under the comprehensive scheme. Philip Slater became head of the combined school, the Chain Bar and Moss House sites now being referred to as the Upper and Lower schools. The latter had been co-educational, but the girls were gradually moved into the Girls’ High School on Brookside Road. During 1967-68, the Upper School lads were strictly forbidden from ‘fraternising’ with the lasses! 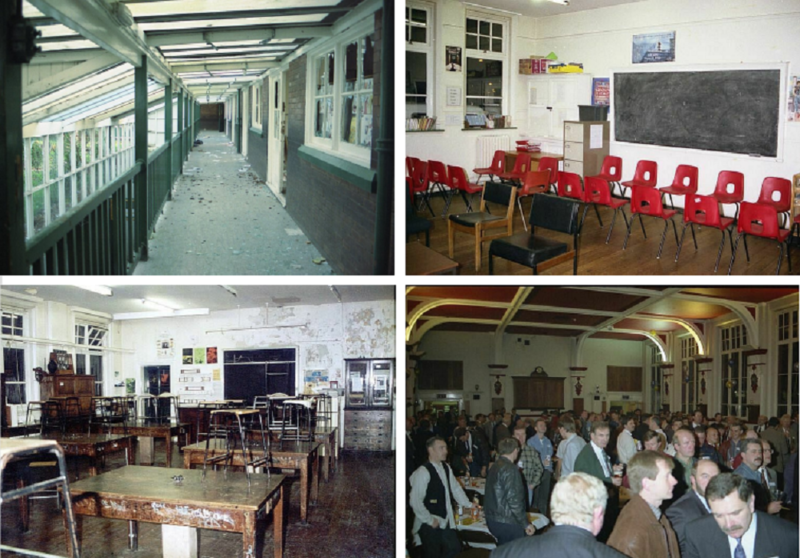 I left school in 1969 and, besides a brief visit in 1971, did not enter again until the school’s only Reunion, held on 1 December 1995 to mark the imminent closure of the Upper School, which gave way to a newly refurbished and extended Lower School. 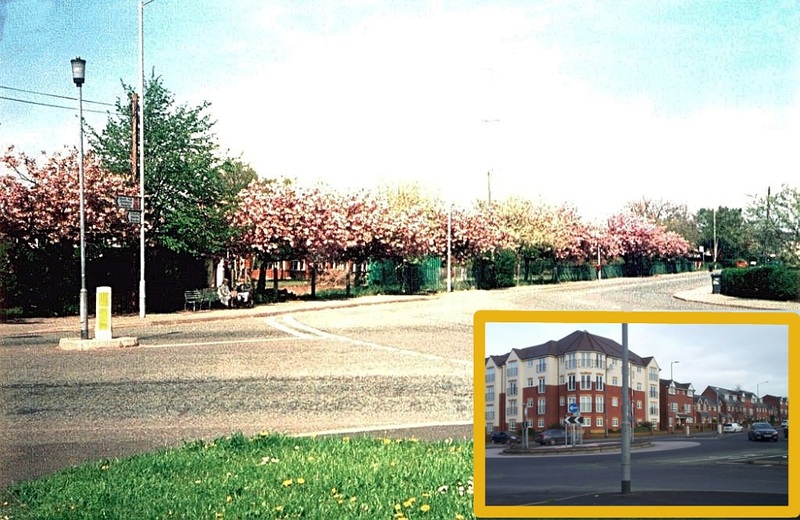 The Chain Bar buildings, old and new, were demolished in April-June 1997 and the land left to settle until 2004, when houses and flats were constructed over it. 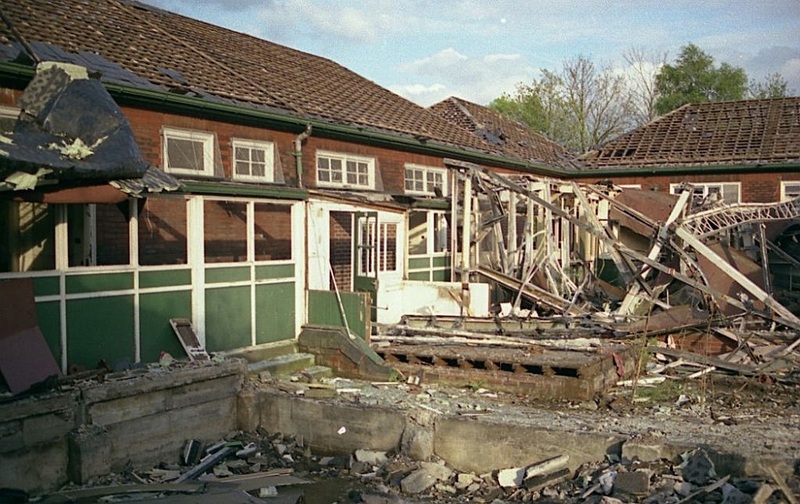 The buildings during demolition on 9 May 1997. The tangled remains of the Biology lab, Room 8, are on the right and, in the centre, the floor of the greenhouse, Room 10. 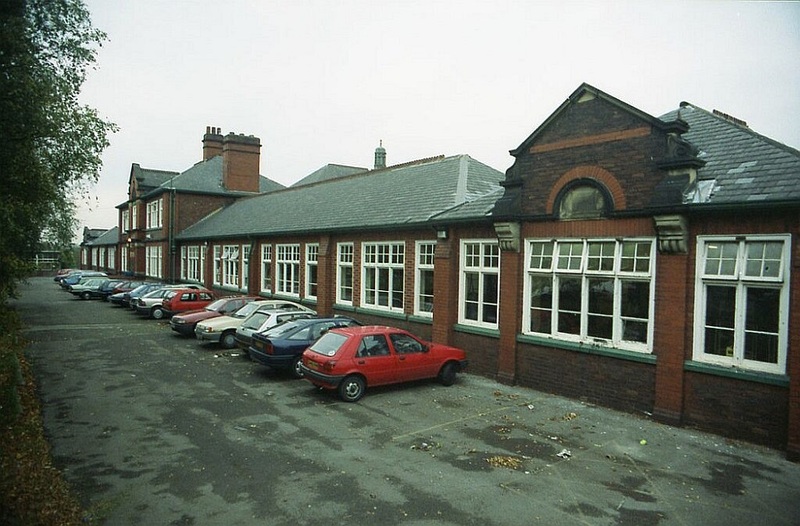 In August 2009, boys at the erstwhile Lower School moved again, to the Co-op Academy off Victoria Avenue East, followed in 2012 by the girls from Brookside Road: both these sites have now also been cleared, and the name ‘North Manchester High’ has disappeared, except from the memories of those who once attended. The school in happier times, from the corner of Charlestown Road, hidden by cherry trees in full blossom in 1995. 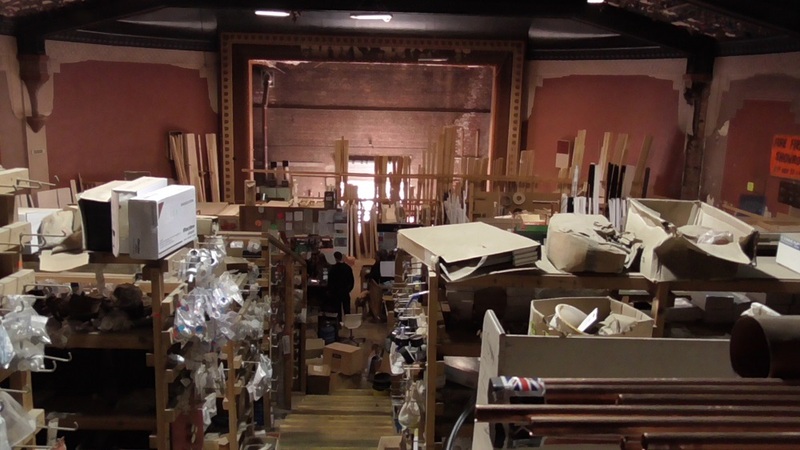 Inset: a similar view now. [Both photos by Steve Wilson]. 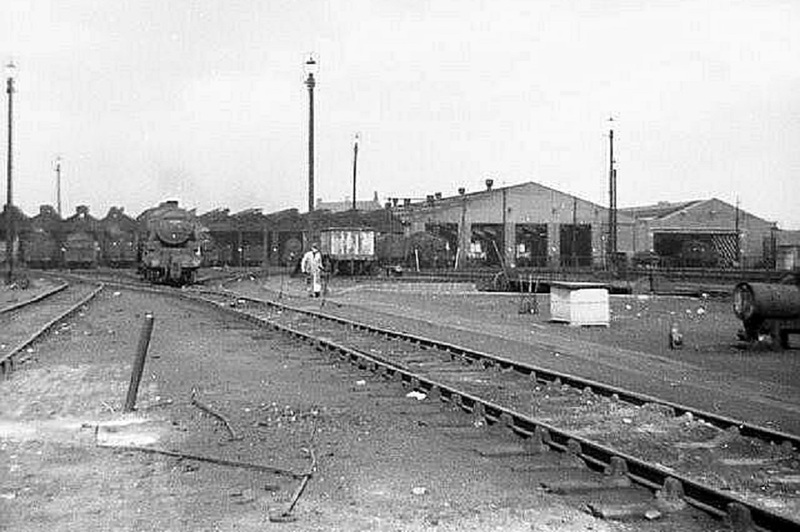 The carriage works on North Road had opened the previous year, and in the 1890s extensive carriage sheds and sidings were added on the opposite side of the Rochdale line, completing a huge complex. Many of the houses off Lightbowne Road were built originally for railway workers. 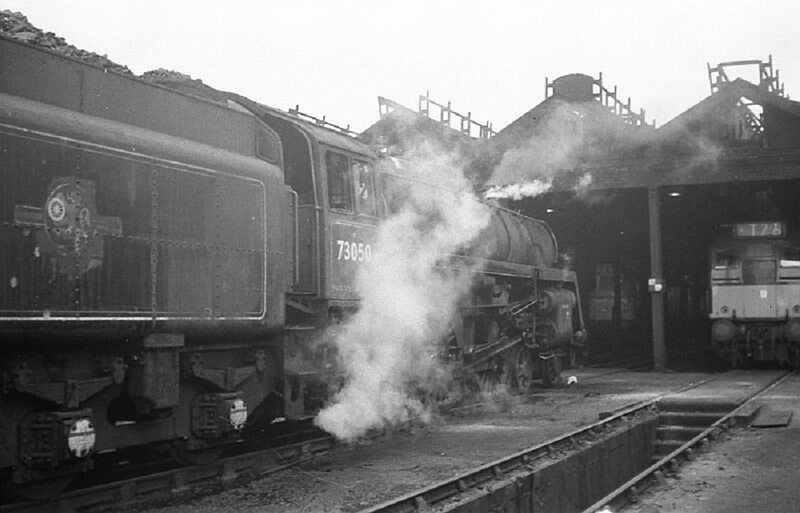 By 1961, half the shed had been rebuilt to accommodate diesel units and the ‘parlour’ re-tracked, but there were still 140 steam and diesel locos based here for the many services, principally to the north, west and east of the country, as well as local trips. Besides the ‘home’ fleet, many engines from other areas often called in for servicing. Like many others, I was a frequent visitor in the shed’s latter years, and it became a place to meet friends and observe the constant movement of locomotives in and around the yards, and trains passing on the adjacent lines. Even on winter nights, coal braziers, lit to keep the water columns from freezing, provided welcome warmth for huddled ‘spotters’ comparing notes. 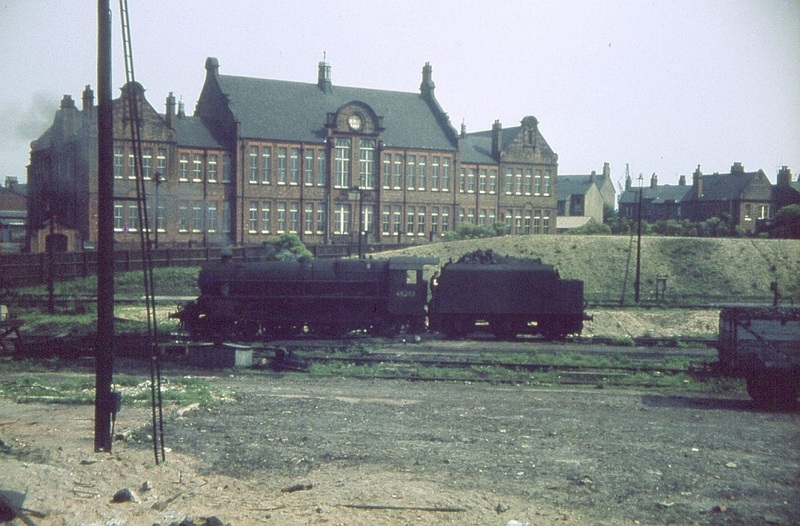 The steam buildings were demolished in March-April 1969 and the coaling tower in July; having defiantly withstood an attempt with gelignite, it leaned at a crazy angle for several weeks before finally succumbing. 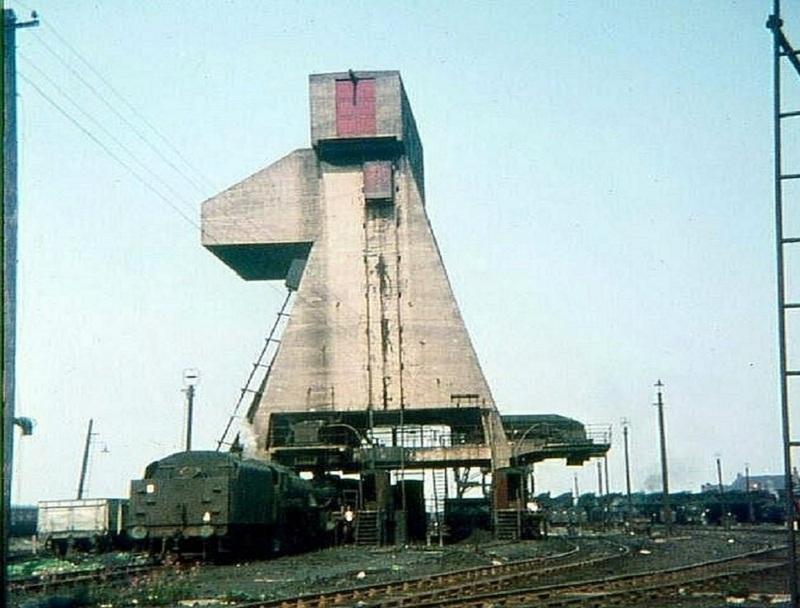 In 1971 the diesel shed was extended and a washing facility erected on the coal tower site, leaving the refurbished ‘parlour’ as the only part surviving from steam days. Today the depot still services diesel units (rather fewer since Metrolink took over some local services), but is much reduced from its former busy, if sooty, glory.